The duck face has caused more deaths than our finned friends this year. 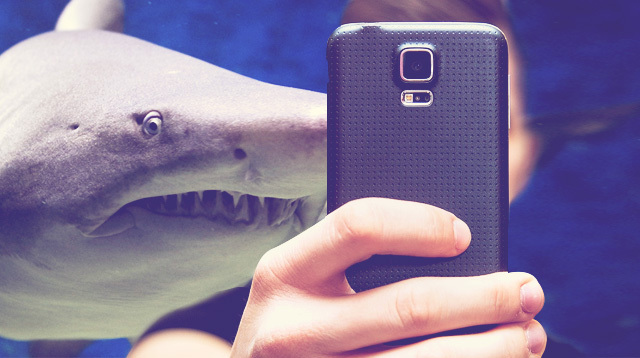 Selfie-related deaths have officially outnumbered the number of fatal shark attacks so far this year, and given the bad press sharks get (for the record, we love our ocean dwellers), we can't help feeling a little surprised by the findings. According to reports, selfie-related incidents have taken at least 12 lives already this year, as opposed to only eight people who have died from shark attacks. Although those numbers are quite low, death by selfie is really preventable which is why it's so shocking. The latest person to take a fatal selfie was a 66-year-old Japanese tourist who fell down the stairs at the Taj Mahal after suffering a heart attack, all while attempting to snap a selfie. The incidents have already prompted the Russian government to raise awareness about the dangers of selfies with a poster illustrating particular risks. Although it all sounds ridiculous, it reminds us to assess the risks of a situation—especially while traveling—before focusing on your phone screen. A few things to remember include being aware of unstable ground, cliff faces, animals, and just your general surroundings before whipping your phone out. We can't help thinking it could be time to introduce "safe selfie" lessons into the school curriculum somehow.